Why cancer and ageing ? Worldwide demographic changes (in Europe, around 30% of EU citizens will be aged 60 years or more by 2030 – in the world, the World Health Organization (WHO) estimates that the population over 60 will grow from 900 millions in 2014 to 2 billions in 2050), the expansion of the number of patients with chronic conditions (150 million+) or cancer (more than 1.3 million of death in 2011 in Europe was due to a cancer) will raise serious issues in the sustainability of health and social care systems across many countries such as EU Member States, which will look for innovative strategies towards into redesigning them. The burden of disease has changed from acute, short-term, curable ailments with external causes (infections, injuries) to long-term, chronic, incurable, health problems often connected to life-style –related issues. Cost inflation: more is spent on therapy and intervention, but for less impact on health outcomes. Patients are now more empowered due to improved availability of information, broader choice of options, monitoring devices, support for self-observation, and purchasing power related to various services. The service supply side is fragmented due to increasing specialization into a variety of production units with different technologies, operating logics, and business models, not being connected with each other, while the demand side is also fragmented due to demands on individualized treatment, not applied holistically. Although there is an attempt for Active & Healthy Ageing, measures are taken too late and should happen across the life cycle. Thanks to decreasing diseases prevalence, anticipating acute events during patients’ pathways and avoiding intensive care and hospitalizations, as the associated direct and indirect costs. The most prominent feature of ageing is a gradual loss of cells and functions giving rise to age-related chronic pathologies, such as pulmonary, head and neck, neurodegenerative, muscular, metabolic, and renal disorders as well as many others. Additionally, the occurrence of carcinomas, like these age-related chronic diseases, strongly increases in incidence with age. However, carcinomas have a very different outcome than degenerative chronic diseases, being hyperplastic in nature. 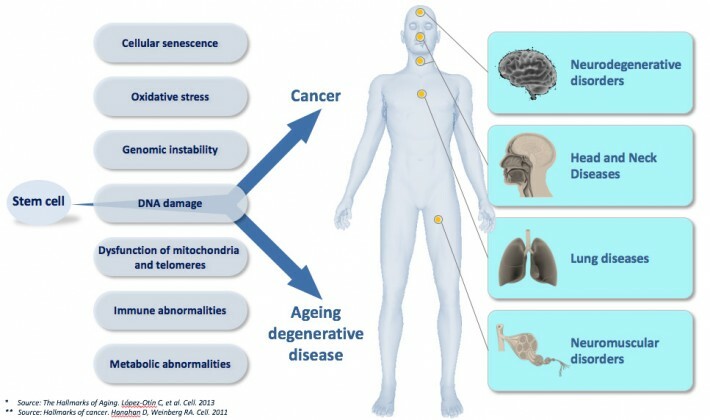 The fact that degenerative and hyperplastic pathologies increase with age reflects that common mechanisms link ageing, degeneration, and cancer. From a wealth of published studies, it emerges that at least one process, namely cellular senescence, links ageing to both degenerative and hyperplastic pathologies. Indeed, both age-related chronic diseases and cancer share immune, inflammatory, and metabolic abnormalities associated with conditions inducing cellular senescence including oxidative stress, genomic instability, DNA damage, dysfunction of mitochondria and telomeres as well as insulin resistance. On one hand, the accumulation of senescent cells contributes to many age-related chronic pathologies such as for example in the chronic obstructive pulmonary diseases (COPD) along with emphysema, pulmonary idiopathic fibrosis diseases (PID), which are age-related lung disorders representing the most prevalent clinical manifestations of telomerase mutations in humans, an enzyme controlling the pace of replicative senescence. Rather than contributing to cancer, cellular senescence pathways are potent tumour suppressors, specifically as protective barriers against somatic cell immortality, clonal evolution and tumour progression. Overcoming these barriers is therefore a prerequisite to cancer progression. Consequently, manipulating cell senescence pathways should bring clinical value in devising both novel anti-cancer and anti-ageing interventions through, respectively, their restoration, moderation or clearance altogether. For instance, counteracting the cellular and systemic conditions that trigger accelerated cellular senescence through pharmacological interventions would be a promising « universal » therapeutic strategy to prevent or delay many common age-related chronic diseases, such as atherosclerosis, COPD/emphysema, sarcopenia, diabetes and Alzheimer diseases. Additionally, some rare genetic diseases are associated with pathological features normally seen in the course of the common age-related chronic diseases. Deciphering the clinical features, the biological markers, the lifestyle and environmental factors that are shared between rare diseases and common chronic age-related pathologies should lead to the development of rationalized new clinical practices, including the validation of surrogate biomarkers of frailty and predisposition, the definition of active prevention strategies, age-friendly lifestyles and environments and new therapeutic targets in the era of precision and personalized medicine. In conclusion, the Ageing phenomenon and cancers are very complex and multi-level challenges, where high-level research in medicine, genomics and biology should be combined with the societal approach centred on the individuals. FHU ONCOAGE has adopted this holistic approach combining genotype and phenotype factors within the ageing process. To do so, FHU ONCOAGE gathers high-level researchers and clinicians with the whole ecosystem required for a comprehensive approach, embedding public policies about health & social care, families, urban design, transport, economy/innovation; nutrition; physical & cognitive activities; and social inclusion. 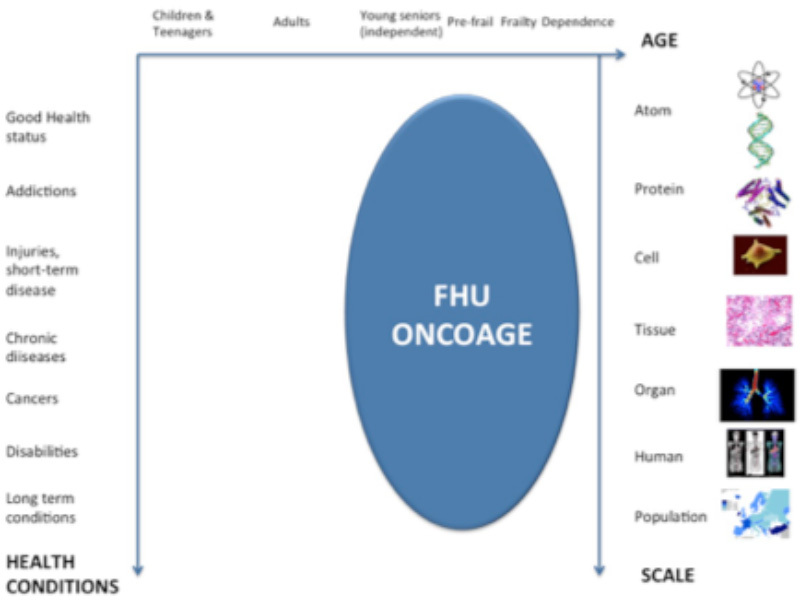 The stakeholders involved in the FHU ONCOAGE ecosystem are policy-makers, companies (large and start-ups/SMEs), funders of health and social care, investors, citizens and patients’ representatives. The cooperation between these stakeholders will greatly ensure the feasibility and the implementation of the innovative results produced by the consortium, such as new clinical practices, prevention programmes or behaviours and living environment improvements. Innovation is a main part of this vision and will positively impact the concept of Ageing. The Ageing challenge is then transformed in opportunity in terms of innovation, technological and services business creation (start-up) and development (SMEs and large industry) and the creation of jobs. Innovative fields, such as silver economy, smart cities, wearables, Internet of Things (IoT), web and mobile industry, etc. are joining the more classic healthcare industry (pharma, diagnostics and medical devices…) to design and develop new health and social services (personalized health, prevention and wellness programmes, homecare, etc.) involving ICT and new technologies. high-level research and innovation activities aim to produce positive outcomes at the same time to improve the lives (quality of life, health status) of older citizens, and simultaneously to support economic development and growth).